[ppopup id="190"]Sign up to our newsletter[/ppopup], follow us and tell your friends with the buttons below. When should I order my Catalogue Printing? More often than not, clients are in a huge rush to have their catalogues printed. Why not? After all it’s been months in the making from product selection, photo shoots, copywriting sessions, multiple layout and design drafts. Many of our clients have worked on these aspects for 6-12 months. Now you finally have the finished article in pdf format and ready to print. You need to see it in the flesh! You will need sufficient time to check the final ripped proofs. Despite lots of previous design proofs, it’s rare we get past ripped proofs without clients finding some last tweeks to make, or mistakes that were missed. Printing and print finishing is an art. Printing presses and finishing machinery are fantastically engineered tools, but still need to be run by professional, skilled operators. These operators need the correct time to focus on getting your job through in the perfect manor. A phrase known to every printer is “There’s always time for a reprint”. No matter how urgent a job is, no matter when the absolute deadline is. When the job goes wrong for whatever reason, there is always time to reprint it to get it perfect. If only a little more time had been taken initially, the job would have been perfect the first time around and been ready much sooner. Okay, okay! So how long does catalogue printing take? If your asking how long you should allow for printing your catalogue then hopefully this means you’re forward planning? If that’s the case we can schedule your print run in advance. We can buy the paper at the best rate, and in time for it to arrive just before your print run. 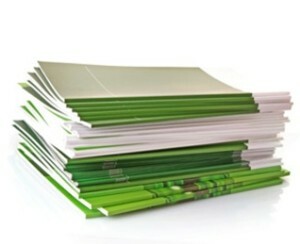 Rest assured we want your catalogue to be produce quickly and efficiently. We also want to meet your deadlines but like to point out the pitfalls of rushing something such as high quality catalogue printing. Your company product catalogue (or your clients) is a hugely important piece of material – lets get it right first time! Obviously the time scale depends very much on your specification with larger catalogues or higher quantities taking longer to produce. Most catalogues are turned around in 2-4 weeks, however when ordering large amounts of paper in advance this can take an extra 3-4 weeks. The more time you can allow, the more time you will have to go over proofs and plan in time for press checks if required. Planning in advance and getting artwork finished early also takes all the stress away leaving you with lots of energy to focus on the launch and distribution of your printed product catalogue.